Since its graduation season, I thought now would be a good time to share some of the many, many stories that have come out of one of West Virginia's premier institutions of higher learning. Ghost stories can be found on just about any campus, but there seems to be more than a fair share coming from West Virginia University in Morgantown, WV. This is just a short sampling of some of the many haunted locations found on campus. Please check back for further updates! This first story is one of my favorites, although it is quite tragic and sad, lol. 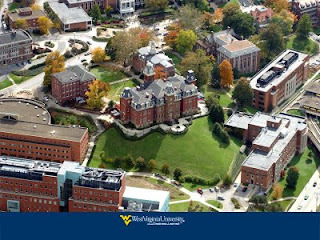 Anyway, when WVU first opened its doors in 1867, it wasn't called West Virginia University. Instead, it was known as the Agricultural College of West Virginia. During these early years, the college used a building that was formerly home of the Woodburn Female Seminary as their main residence hall. When that building burned in 1876, a new building was erected over the site, known as New Hall. In 1878, expansions were made, and New Hall was renamed University Building. It wasn't until the early 20th century that a north wing was added to the structure, and the building was christened Woodburn Hall, the iconic building that we often associate with the campus and school itself! One of Woodburn Hall's outstanding features is its impressive Seth Thomas clock and clock tower. It is this clock tower that is the home to our legend. Apparently, it is a widely known legend that during the university's tenure as an agricultural college, several students pulled a prank that would go horribly wrong. Hearing the old saying that you can lead a cow up the stairs, but can't lead it back down again, that's exactly what this group did. They stole a cow from a school-owned farm and marched it up the bell tower where it mooed and bellowed like crazy. Of course, the students found out that the saying was TRUE! They could not get the cow to come back down, and thus it had to be killed on site, and chopped into smaller pieces for removal. Visitors today still claim to hear the ghostly, ethereal moos emanating from the clock tower, a grisly reminder of a "harmless" prank gone wrong. WVU's downtown campus library was built in 1931, and like many college libraries, quickly has gained the reputation for being haunted. A wide variety of events happen at this center for knowledge, including the sounds of writing coming from empty desks, apparitions sighted among the shelves, and a feeling of being watched that permeates a section of the 10th floor, now used only as a storage area. One of the most prolific ghost stories to come from this library is the story of an employee who met his death by falling down the elevator shaft during maintenance. His apparition is commonly seen getting onto the elevator, or exiting on various floors. He disappears if anyone tries to come near him. E. Moore Hall was built between 1926 and 1928 and serves as a women's physical education building. It was named for the principal of the Woodburn Female Seminary Institution from 1865 to 1866. Elizabeth Moore is also said to be the resident ghost, who likes to make her presence known in the basement pool area. The MountainLair is WVU's student union building. Its a perfect place to socialize, get something to eat...and apparently to spot a ghost! Janitors working the building late at night have often reported seeing a little girl wearing a yellow party dress. It is believed that the little girl was buried in a cemetery where Stewart Hall now stands. You can also add Eisland Hall, which was the original building for the College of Creative Arts before the CAC was opened in 1969. One of the techs fell to his death from the rigging above the stage and haunts the place. Some current techs believe that the ghost moved to the current CAC, and very superstitious ones won't enter the theater at the CAC without saying hello to "Rupert." If they don't say hi to Rupert, they believe things will go wrong that day with the lights, sound system, or something else. Thanks for the tip! I only scratched the surface of WVU and Morgantown haunts, so I'll definitely look into Rupert's story a little more! Thanks again! This story is from a residential area in Morgantown, but interesting and perhaps could be researched. I went to WVU from 91-95. In 92, I stayed the night at my friends' apartment (two stories of a very large, old house). I don't remember the exact address, but if you travel up Spruce street (the one-way parallel to High), it's the last right turn before Willey Street (kind of across from the BBT parking lot on the other side of Spruce). Anyhow, the girls were pretty terrified of "whatever" they shared the house with. Its activities included stopping up drains, closing/opening windows, locking girls out of their bedrooms (from the INSIDE). One friend's bedroom had the attic door in it, closed with a hook latch from the outside. She once heard what she thought was the latch and found the hook swinging. Another came home to find glass figurines from her dresser several feet away and smashed on the carpet. And also woke one night to "something" dripping wet standing at the foot of her bed. All of them had heard what sounded like a child running up and down the stairs, multiple times. These girls were not making it up, they were truly frightened. Well what makes a notable case is that, the following year I met a new friend while working at Arnold Hall. "Jill" dated a guy who lived at the corner of Spruce and the street I mentioned above, about 1 or 2 blocks from the house I just described. Jill did not know the other girls, and by the time I met Jill the others had moved out. But she told me a scary story of one night that she was walking in the parking lot to her boyfriend's house, and she very clearly saw the apparition of a transparent young boy (she assumed 9-11 in age) running towards her (towards the direction of the house my friends had lived in). When she told me the story I remembered my friends' house and how close it is. We figure that maybe it's a ghost of a boy associated with that house (Jill saw him clearly enough to describe his clothing as 1960s to 1970s in style). I wish I had the address to share for it to be investigated. Best I can describe is about one to two blocks up that street, on the right, very large older three story (plus perhaps a basement) and I think if you're facing the house, there are stairs or a deck off to the right side that led to a basement apartment. But who knows, it could be razed by now. For years I always wanted someone to investigate it. Creepy! Thank you for sharing this story; hopefully someone in the area can investigate it further. I'm a current student at WVU and I think I know exactly where you're talking about. The street is Forest Ave. I'm not sure of the address, but there are two houses that come to mind. They're both a block up the street past the church on the left side and on the corner of Baird St, there is a house 3 stories tall, very old looking, with very light bluish siding. On the right side of that house, there are stairs/a deck, but they lead up. Two houses away from that one, on the corner of Dallas St, there's another 3 story house/duplex that is grey in siding color with a white "porch". On the left side of that house, there are concrete stairs leading down to, what I believe is, a basement apartment. I would love to investigate and try to figure out which house it is, but I do not know the students living in either of those two apartments. If you happen to check up on this blog, maybe you can clarify to me which of these two houses it was. Maybe I can somehow ask the students currently living there if they've experienced any hauntings. I've always been fascinated by ghosts and it would be cool to look into this. Also, several students have said that Boreman Hall North is haunted, and Boreman Hall South is haunted too (by a different ghost). About a year ago, a freshman boy staying in Boreman South hung himself in his room. My friend was staying in Boreman South this year and he had a friend who was either living in that room, or near that room. He told me a story of how his friend living by that room could hear the sounds of the belt that the boy used to hang himself snapping and other peculiar noises. Very eerie. Do you know what floor the kid hung himself at boreman south? I'm going to be living there in a week and want to investigate. Yeah can you tell me if it is room 103 boreman south? Theresa's Top Links for May!